Facebook’s core attraction isn’t news articles you could find anywhere, it’s intimate posts from your real friends. 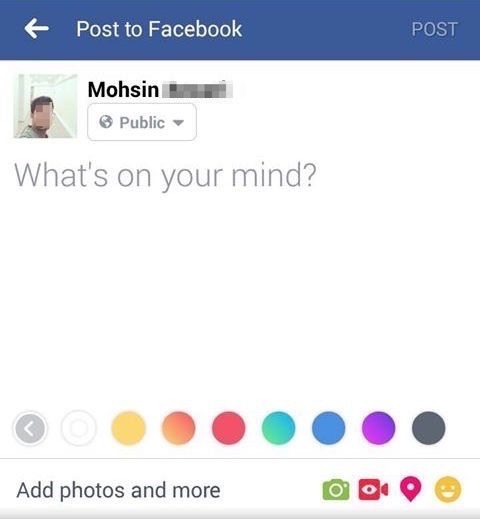 That explains why Facebook is trying to make highly personal text statuses as eye-catching as photos with the new test of a colored background option. The feature lets users select a color that appears behind their text status in place of the normally-white background. Several of the color options offer an Instagram logo-style color gradient, which make them more stylish and modern than boring flat colors. Sent to TechCrunch by reader Hoan Do over the weekend, Facebook confirms this feature is in testing. It appears that it’s only testing in certain regions abroad, not in the US. Users without access to the test don’t see the colors if they look at the post, but that would likely change to everyone being able to see the colors if Facebook rolls it out more widely. [Update: Facebook has now shared more details and a statement about the new feature. Colored status backgrounds are rolling out globally over the next few days. Only Android users will be able to create them, but everyone on iOS, Android, and web will be able to see them in the News Feed. Adding spice to status updates could help Facebook boost “original sharing” of unique personal content, as opposed to resharing of news articles and viral videos. In April, The Information reported that Facebook was experiencing a decline in original, personal sharing. Apparently “original content broadcasting” was down 21% year over year as of mid-2015, and original broadcast sharing was down 15% year-over-year as of April. Facebook has tried to downplay that claim in the past, saying original content sharing was healthy. But VP of News Feed Adam Mosseri admitted on stage at TechCrunch Disrupt SF in September that sharing of professional publisher content has grown at a faster rate than original sharing, making the latter a smaller percentage of total content. That may have played into Facebook prioritizing friends and family instead of publishers in an update from September, which could restore a balance with more original content in the feed. Facebook seemed to already be encouraging text status updates with a ‘big text’ feature that shows words in a larger font if your status is short, thereby making it more attention-grabbing. Both of these features could be see as trying to steal thunder from Twitter, which is the most ubiquitous text-focused social network, though one dwarfed in size by Facebook. Yet CEO Mark Zuckerberg has said repeatedly that he sees rich media like video, 360, and VR as the future of sharing on Facebook. But there will always be some things best expressed with some simple words. Colored backgrounds make sure a spontaneous exclamation or a bit of poetry won’t get lost in the increasingly flashy feed.